Turner River Road is one of the most scenic roads in Everglades City. For 21 miles, Turner River Road cuts directly north through Big Cypress National Preserve. This preserve is a Federally protected land consisting of 729,000 acres of cypress strands, wet prairies, and pinelands. Running alongside the road is the Turner River Road canal. The sand, shell, and rock dredgings of this canal are the materials that initially formed the road. Straight as an arrow, this road is a seemingly endless bed of crushed rock and sand, only a few feet above water level. It extends north of Interstate 75, taking visitor traffic from the Tamiami Trail and diverting it deeper into the Everglades. Turner River Road is a one-way-in, one-way-out route. It has become a beautiful viewing platform for the vast array of wildlife along the canal. The canal runs directly along the road, nearly to the very end, stopping at Bear Island. Aside from a few areas where vegetation blocks direct sight, all passengers in most types of vehicles can enjoy great viewing along this drive. The wildlife can be seen all year, but is most abundant during the Fall, Winter, and Spring. Some visitors have counted over 100 alligators in the water or sunning on the shore during a single drive down this road! Although there can never be a 100% guarantee of wildlife sightings, there is no better site for those looking for the best chance of viewing and taking pictures of birds and animals in their natural habitat. Common moorhen, pied-billed grebe, and common loon can also be found paddling throughout the length of the canal. It is not uncommon to see flocks of 20 to 50 same-species birds feeding along the canal. Birds and alligators are most prominent in this wildlife drive. 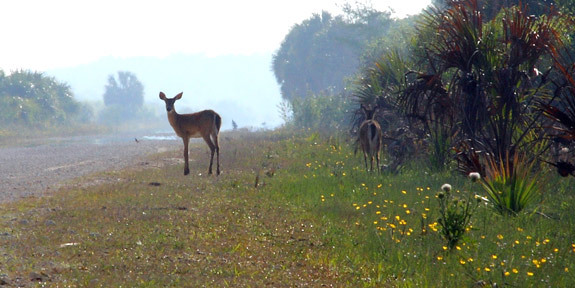 However, because you will pass through several Florida ecosystems, it is also common to see wildlife such as white-tailed deer, wild pigs, raccoons, river otter, bobcat, and even the endangered Florida panther on occasion. Turner River Road gets its name by the nearby “Turner River”, which is a favorite destination of canoeists and kayakers. Copeland, Florida is the nearest city, and a side trip to Everglades City for lunch or dinner is less than 15 minutes away. An early morning or early evening drive along the road provides the best opportunities for viewing. Turner River Road is located in Southern Collier County approximately 6 miles East of the intersection of Florida State Road 29 and US Highway 41 (Tamiami Trail). Photo by Monica R of Flickr.